Aug. 8, 2017 - Northern New Jersey’s industrial history continues to effect two popular recreational fisheries, striped bass and blue crab. Examining how toxic waste from the past continues to impact people and wildlife today shows the importance of continuing to cleanup and restore polluted habitats. Striped bass is prized both for its taste and for the challenge in catching the fish. Its popularity in sports fishing circles rivals that of salmon. Yet because of pollutants found in the fish, the New Jersey Department of Environmental Protection cautions people to limit their consumption of striped bass caught in the state and advises high-risk individuals—including children—not to eat them at all. For striped bass caught in some of the northern parts of the State, like in the Newark Bay Complex – the bay and its tidal tributaries – the department has even stricter recommendations for limiting consumption. Since the beginning of the twentieth century, the northeastern part of our country was heavily industrialized. Plastics, dyes, pharmaceuticals, and paint are just a few examples of important manufacturing that took place in these areas and that released, as by-products, toxic substances such as mercury, chromium, arsenic, lead, and PCBs into local bodies of water. Because striped bass move inland to spawn, they are accessible to recreational fishers but exposed to the contaminated sediments that remain in some of these areas from their industrial history. Striped bass is a long-lived predatory fish that feeds on smaller fish, so bioaccumulative contaminants (like mercury and PCBs) can build up in its tissues. These contaminants are harmful to people who consume the fish and are unhealthy for the fish themselves. Found in brackish estuarine areas in the same region are blue crabs. Blue crabs are among the most sought-after shellfish—both commercially and recreationally—and are found from Nova Scotia to Uruguay. Callinectes sapidus, the Latin name for blue crab, means “savory beautiful swimmer.” At about 4 inches long and 9 inches wide, they are prized for their taste. Blue crab serve an important role in the ecosystem as benthic (bottom) feeders and important prey for other fish. But because they live at the bottom of waterways, those found in formerly industrial areas, can be in direct contact with contaminated sediments that are the legacy of the historical discharge of industrial wastes and these contaminants can accumulate in their bodies. 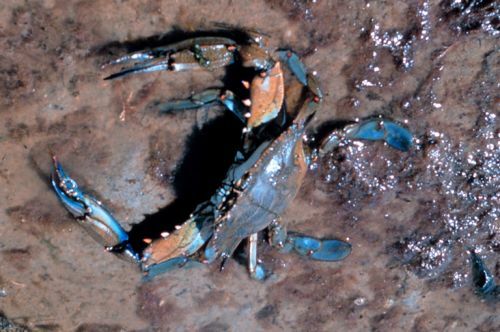 In addition to making the blue crab unsuitable for human consumption, those toxins adversely affect the blue crabs themselves, negatively impacting their survival, growth, or reproduction. The good news is that the process of cleanup and restoration is in progress at many of these contaminated waste sites in northern New Jersey including Newark Bay as well as throughout the country. The industries that contributed to the pollution were developing products we depend on and were bolstering the nation’s economy but it is also essential to rehabilitate contaminated waterways and restore the habitats on which these species depend. 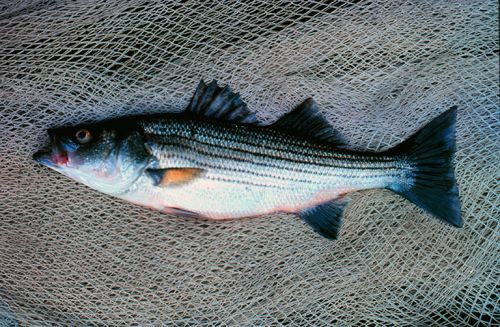 The Comprehensive Environmental Response, Compensation, and Liability Act of 1980, referred to as CERLA or Superfund, guides the reduction of exposure of wildlife like striped bass and blue crab to contaminated areas and enables the Trustees, including NOAA, to recover the costs of restoring or replacing the equivalent of the resources that the public has lost because of the contamination. The Trustees work to ensure that the cleanups minimize ongoing injury to wildlife and the people who use those resources. Trustees also restore clean healthy habitats for fish and shellfish to compensate for the lost use of areas that were contaminated; restored areas are designed to improve fish and shellfish populations and enhance recreational access. How Do You Begin to Clean up a Century of Pollution on New Jersey’s Passaic River? Reyhan Mehran, NOAA Regional Resource Coordinator with the Assessment and Restoration Division, and Vicki Loe, Communications Coordinator for NOAA’s Office of Response and Restoration, contributed to this article. 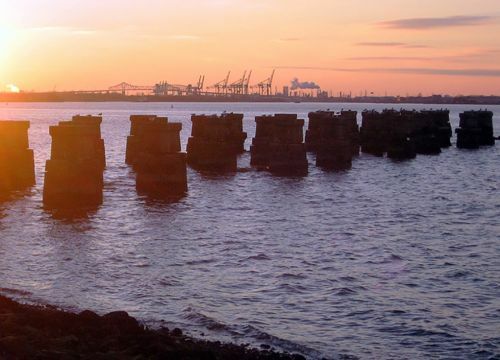 Newark Bay and its tributaries are among the places in northern New Jersey where the federal government has initiated cleanup and restoration activities to address contamination related to industrial releases of hazardous waste. Image credit: NOAA. Striped bass - a popular New Jersey sport fish and top-level predator - can accumulate high concentrations of unsafe contaminants. Image credit: NOAA. Because blue crab live on the bottom of waterways where contaminants tend to accumulate, they can be unsafe to eat in formerly industrial areas. It's always important to be aware of any consumption advisories in place for bodies of water before eating what you catch. Image credit: NOAA.